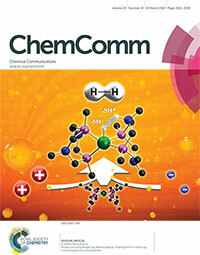 An invited review of proton relays in nickel catalysts graced the cover of Chemical Communications’ cover. The artwork was prepared by Dr. Jonathan Darmon and Dr. Charles Weiss, PNNL. Cover reprinted with permission of the authors and the Royal Society of Chemistry. Enlarge Image. Results: Storing intermittent solar and wind energy in chemical bonds for later use requires a detailed understanding of how protons flow. In their invited review for Chemical Communications, Dr. R. Morris Bullock, Dr. Aaron Appel, and Dr. Monte Helm at Pacific Northwest National Laboratory (PNNL) describe how proton relays and other factors influence the catalysts that produce the desired chemical bonds. 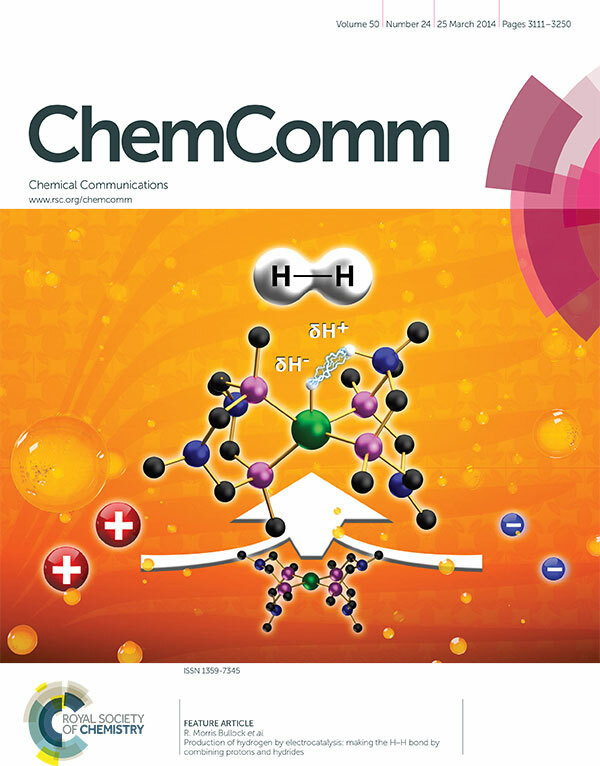 They were asked to write this review for a special themed collection in the journal on electrocatalytic hydrogen evolution because of their groundbreaking research in proton movements in reactions that break and form hydrogen. Dr. Jonathan Darmon and Dr. Charles Weiss at PNNL designed artwork that graces the journal's cover. Controlling protons' motion and the release of the hydrogen molecule produces fast, efficient catalysts based on abundant metals, rather than precious metals. The scarcity of platinum, rhodium, and other metals makes them unsustainable for use on a large scale. "Our ultimate goal is to use cheap metals for noble tasks," said Bullock, Director of the Center for Molecular Electrocatalysis, an Energy Frontier Research Center funded by the Department of Energy's Office of Basic Energy Sciences. Why It Matters: Would you want a car that only ran when the sun shined? A dishwasher that only ran when the wind blew? Solar and wind energy are sustainable, carbon-neutral energy sources, but their role on the nation's energy stage may be limited unless the resulting electricity can be stored. One option is to store the energy as chemical energy in the hydrogen-hydrogen bond. "We are gaining the understanding necessary to rationally design catalysts that match the functionality of enzymes, natural catalysts that use nickel and other abundant metals," said Appel. Methods: In the article, the authors focus on pendant amines, dangling molecular chains with nitrogen atoms that act as proton relays. Placing pendant amines correctly puts the reaction's hydride or hydrogen anion and proton in the right spot to interact. A poorly placed or missing amine can stall the reaction. "We don't necessarily need more proton relays to improve catalytic performance," said Helm, the Center's Deputy Director. "The research demonstrates that delivering protons to the right spots for the catalyst to use productively is the most important factor in determining catalytic performance." Another key factor is how quickly the catalyst releases the hydrogen, once formed. The release rate is strongly influenced by the thermodynamics of breaking both the hydride and the proton from the catalyst; both of the hydricity (hydride donor ability) and acidity (proton donor ability) can be varied in the catalyst. In addition to the internal design of the catalyst, the environment also matters. Protons move more quickly, speeding the catalyst, when the basicity of the pendant amine is thermodynamically matched to the acid, also known as pKa matching. What's Next? While this review focuses on nickel electrocatalysts for creating hydrogen, the science and the underlying principles can be applied to other catalysts. For example, further research is being carried out on cobalt, iron and manganese complexes. These findings apply to more complicated reactions involving oxygen and nitrogen that are also critical in energy science. "We want to store energy as densely as possible. Chemical bonds can store a huge amount of energy in a small amount of physical space," said Bullock. Electrical energy is nothing more than electrons. These same electrons tie atoms together when they are chemically bound to each other in hydrogen gas or other molecules. Holding electrons in chemical bonds is one way to store electrical energy generated at wind and solar stations. Electrons are often stored in batteries, but scientists want to take advantage of the closer packing available in chemicals.